It's not so bad to hand your child an iPad once in a while depending on how it's used. Playing a game together or Skyping with Grandma? That's OK. Helping your little one calm down or trying to keep peace in the house? Not so much. New guidelines announced by the American Academy of Paediatrics today say parents not only need to pay attention to the amount of time children spend on digital media -- but also how, when and where they use it. 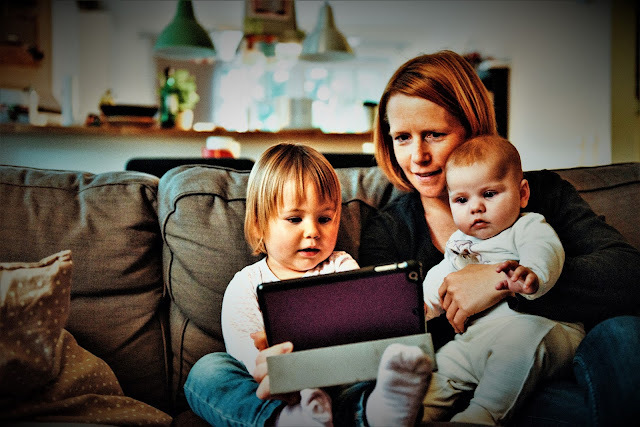 "Digital media has become an inevitable part of childhood for many infants, toddlers and pre-schoolers, but research is limited on how this affects their development," says one of the lead authors of the statement Jenny Radesky, M.D., a developmental behavioural expert and paediatrician at University of Michigan C.S. Mott Children's Hospital. Radesky co-authored the statement for children ages 0-5 with Dimitri A. Christakis, M.D., M.P.H., of Seattle Children's Hospital. The AAP also put out a separate policy statement the same day for older kids (ages 6 to teenage). "What we do know is that early childhood is a time of rapid brain development, when children need time to play, sleep, learn to handle emotions, and build relationships. Research still suggests that excessive media use can get in the way of these important activities. Our statement highlights ways families and paediatricians can help manage a healthy balance." "Video chatting with grandparents, watching science videos together, putting on streaming music and dancing together, looking up new recipes or craft ideas, taking pictures and videos to show each other, having a family movie night … these are just a few ways media can be used as a tool to support family connection," Radesky says. Radesky notes that it is crucial that adults interact with children during use, to help young children apply what they're seeing on the screen to the world around them. Research shows that for the youngest children -- ages 18-36 months -- this is essential, she says. Paediatricians are also encouraged to help parents be "media mentors"- role models and guides for how to pick good digital content. Doctors have an opportunity to educate families about brain development in the early years and importance of hands on social play for language cognitive and social emotional skills. They can also guide parents to resources for finding quality products. "Paediatricians have the opportunity to start conversations with parents early about family media use and habits,'" Radesky says. "We can help parents develop media use plans for their homes, set limits and encourage them to use devices with their children in a way that promotes enhanced learning and greater interaction." Consult the American Academy of Paediatrics Family Media use plan. Ask your paediatrician if you need help.